Personally, I love September. Even when the school calendar didn’t directly affect me, I still thought of September as the beginning of the year. Now that I’m a parent, it marks milestones in a different way. My youngest son, Andrew, spends his summers with his father in Mississippi. September marks the transition from hot, steamy days spent with far-away friends at the pool and life as an “only child” with different rules, to cool nights and more structured days full of school, karate, scouts, and the riding around that comes with having an older brother involved in high school activities. This year, it also involved changing schools to start the fourth grade. This means switching classes and having a planner! It also means the school day starts an hour earlier (something for which I am tremendously grateful). His teacher shares his love for karate and his best friend is in his class, which is a great thing for a child who struggles with social skills. We are keeping our fingers crossed that this year goes well. In the past, I dreaded the middle school years for Andrew. I plan to focus on the things that make him unique and to help him find his own way. I truly believe he will be fine once he is out of school and able to choose his own interests and friends, but getting there will not be easy. Since my older son plays high school soccer, his year seems to start a little earlier. Tryouts and practices begin a few weeks before school starts. This year, Anthony is a sophomore- a big step up from a freshman. He seems more comfortable this year, both with his classes and the politics of high school. Last year was a difficult one for him. He struggled with high school teachers’ higher expectations and negotiating high school romance. As a kid who wears his emotions on his sleeve, he made most of his own trouble. This summer, he showed a lot more responsibility as he tackled a number of projects and volunteer opportunities. He decided to sign up for more challenging courses this year, with the hope that it will compensate for lackluster grades last year and keep him more engaged in school. 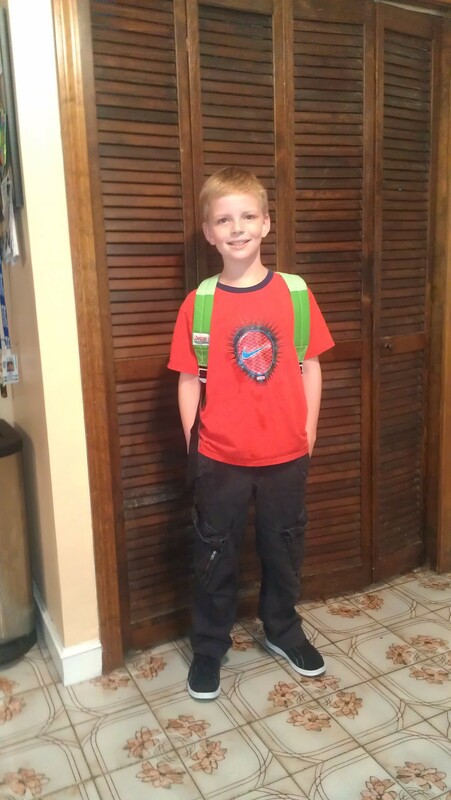 He’ll focus on improving his grades and time management skills, while exploring new interests. Anthony is beginning to look at higher education options. We have visited a few schools in our summer travels and Anthony has done some online research. Other than playing soccer, he has no idea what he wants to do. Being very familiar with college athletics and the level of competition involved, I recognize that playing soccer is probably a lot less likely than he would like to admit. I have found that it’s difficult to parent a high-schooler. My role with him at this point is to make sure he is well-fed (a task in itself), well-rested (another challenge), and well-loved. He knows that I have his back, but that it is time for him to start leading the way. Guidance now comes from a wider circle of influence: teachers, coaches, counselors, friends and the parents of his friends. He has to ask a lot more questions to get the information he needs, which requires him to self-advocate and to handle criticism. This is both exciting and challenging for me. It goes against my nature to bite my tongue, but sometimes the best lessons learned are the ones that come from your own experience. This year I will try to enjoy learning fractions for the last time and getting time alone with my teenager when he is trapped in the car with me (since he doesn’t drive yet). Next year, things will be different again and Anth will want the car without me in it, while Andrew will gradually need my help with his homework less and less. At this point, I have some friends whose children are just starting school and some whose children are out of the house. The best advice I can give is to relish the stage you have. It will never come again but the next one will be just as interesting. Let your children grow, but let yourself grow as a parent too. They will always need you, just in a different way. “The best advice I can give is to relish the stage you have. ” Excellent advice!